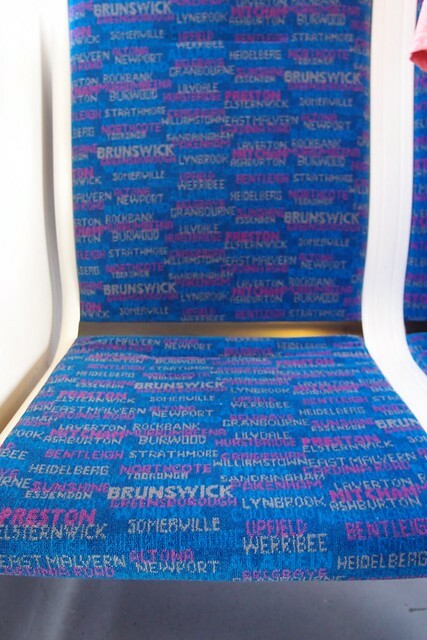 Trials of new seat covers on Siemens #MetroTrains – will they hide the dirt better? The Siemens train seats are notorious for showing the dirt. At one stage a multi-coloured design similar to the Comeng fleet seats was tried, but now Metro have introduced a new design which is supposedly more vandalproof (and uses their corporate design, not Connex’s). It’s on one 3-car Siemens set so far (for the gunzels, it’s 831M-2566T-832M). I spotted it on Friday night but wasn’t able to get a photo, but happily Thomas on Facebook snapped one and posted it in the PTUA’s Facebook page. But anyway, hopefully this new design will do a better job of staying clean and hiding the dirt. This is the kind of thing PTV and/or Metro really should promote a bit more, to let people know they’re actually acknowledging the problem, and to gather feedback. I can’t wait for my bottom to sit on one of those! I dunno if Metro should be promoting the fact that they’re introducing seat covers that “look cleaner”. I mean sure it’s a smart move to introduce them, but I don’t want to be reminded of the fact that the seat I’m about to sit on only hides the dirt better than the old one. Why does Brunswick stand out so much? All I see is BRUNSWICK BRUNSWICK BRUNSWICK. If they’re going to have bigger names which stand out, it should be the names of lines. It’s good though that they’re working on this, the green seat covers look so manky and dirty, and the blue covers with the random shapes are becoming a bit old-hat. I wonder if the new Xtraps will get this fabric instead of e Connex stuff. Cloth seats are a bit more comfortable to sit on but vinyl or hard plastic seats would be much easier to keep clean with just a wipe and they would likely last longer too. The vinyl seats on the w class trams are a good example.